This is a brief summary of what Katie shared and my personal takeaways to Paine’s “The 7 Steps” introduced during her presentation. My reaction to each of the 7 Steps is based on my experience working in a major multinational corporation, dealing with top management and finance approvals, and providing feedback to advertising agencies. 1. Define the “R” – Define the expected results? Champion your Social Media project/plan within the organization by sharing what other companies are doing and the results they are getting. 2. Define the “I” — What’s the investment? Define upfront the budget you’d need to make this work. Determine what is the “size of the prize” (or maybe “loss avoidance”) of participating in the conversation. This is called “new media” for a reason, as this is so new, there wont be enough data to commit ROI to the company but you can surely define some very basic assumptions to measure the “size of the risk” and find an estimate break-even point. Especially, if you are requesting a significant investment, you will need to show the level of risk to Finance before they approve the plan. Make sure your budget is choiceful and focus on what is relevant for your target. You can ensure success, but you can considerably increase your chances by putting your consumer/target at the center of everything you do, from design to execution. Make sure you are able to communicate SM is the right thing to do for YOUR target, don’t just do it because everyone else is doing it. Envision what success looks like, translate this vision into a measurable into a success criteria with clear dates and gates. Have top management agreed on this definition of success. To note, number of fans or followers should not be a goal itself. The big idea behind Paine’s proposal is based on the use of Social Media to generate “engagement”, but importantly this “engagement” needs to drive business. To explain this, she used an excellent example assuming the client is a Medical Institution. Identify what is going on in the market, so your goal are real but challenging. Watch out, do not necessarily follow competition, they might not be doing the right thing and be missing out the real big opportunity. Look for benchmarks outside your category, there might be a completely different category that shares a target similar to yours, you can learn from them and benchmark to what they are getting out of social media. 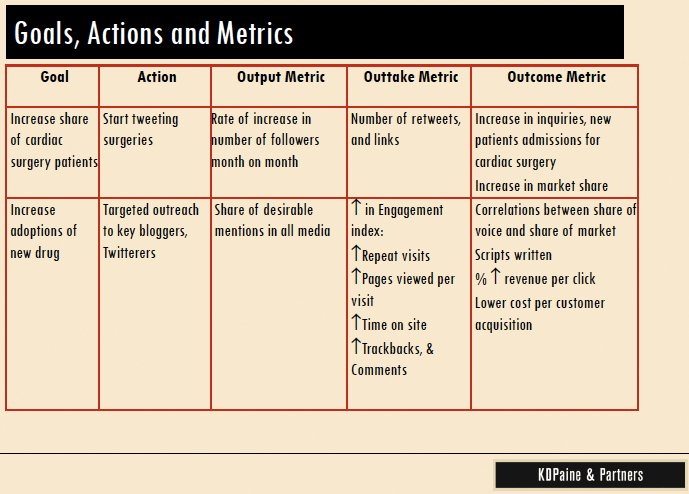 There are several tools, both paid and free, to measure Social Media impact. Some free tools are: Google News/Google Blogs, RSS feeds, Technorati, Social Mention and Twazzup. There are other paid tools that range from $500 on, such as: SAS SMA, Radian 6, Techrigy, Sysomos, Crimson, Hexagon, Visible Technologies, Scout Labs, Cyberalert, CustomScoop, e-Watch, Cision, Vocus, Nexis, Factiva. As a thumb rule, I usually request the Agency to allocate 5% of the budget to research whenever we are trying a new vehicle. There is chances that you will miss the objective, but never miss the learning. It is vital to foster a culture of learning, the importance of measuring should not be perceived as a reward/punish system by your organization. Instead, measuring to identify what worked and what didn’t work, and a good analysis of this results should always be recognized as a good business practice. Finance people tend to support and fund plans that follow a “invest a little, learn a lot mentality”, but to learn you need close tracking. Importantly, keep the organization aware of the progress, even early good results are good to maintain people energized and motivated. If early results are discouraging, timely identify the opportunities and move resources from what isn’t working to what is working. One final thought, large corporations have a vast understanding of traditional advertising and trust its power. Traditional advertising’s stronghold is its effective “reach”, however the message might lack of credibility. On the other hand, WOM has been for years the most credible source of advertising for consumers across categories, but very limited in reach. The beauty of Social Media is that it combines both, the credibility of WOM as you have real consumers talking candidly about your brand and provides the platform to have a more significant reach. Social Media is enabling WOM to unleash its real potential and impact your business. After Katie Paine’s presentation, I left the conference with one phrase I have constantly heard during my years in Marketing: “You get what you measure”.